Prepare to strike as Australia’s Third Strike community will be running an online round robin tournament on February 27th, bringing in a healthy dose of competition that will include seasoned veterans as well as the next generation of 3S players. Natsu Cup is the first of four online tournaments that will have 2 groups of 5 players, Group A and B, battling it out to make their way to the top of the ladder. The competition will commence on February 27th and will go on throughout the week. At the conclusion of the event, the top player in each group will receive: 1 entry fee paid to any Australian fighting game major (Note: this does not include additional tournament entries, flights or accommodation), or a donation of $250 made out to a licensed charity of their choosing. The event will also have a promotion and relegation rule where the top 2 players from Group B will then qualify for Group A, while the bottom 2 players from Group A will no longer qualify for Group A and will be relegated to Group B.
Matches will be played on the Fightcade platform, where the replays will then be uploaded to the Aussie Battlers YouTube channel during the week following the commencement of the tournament. 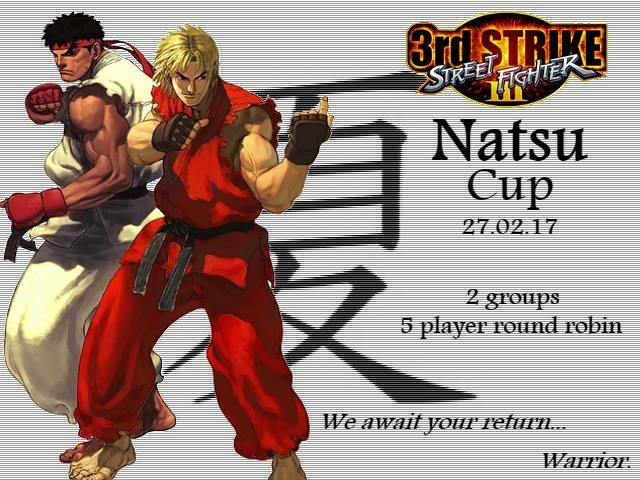 To stay updated on the Natsu Cup and all things 3S in Australia, or if you’d like to be a part of future online tournaments, make sure to join the AUS/NZ Street Fighter III: 3rd Strike fighters group on Facebook. Check out the Natsu Cup Roster trailer and Group A player introduction video after the jump. Last week Capcom announced the online ranking events for this year’s Capcom Pro Tour. One of the two Asia/Oceania online ranking events includes covers Australia and New Zealand. This is a rare opportunity for Australian Street Fighter V players to get involved with the CPT without the need to travel. Requirements: Challonge account, wired internet connection with minimum 3Mbps upload speed. Entry Fee: Free; tournament capped at 256 players. Although entry is free, places are strictly limited and at the time of posting almost 70 of the slots have already been taken. If you meet the requirements and are interested in participating be sure to read the rules on the CPT website then sign up via Challonge. Video archives are also available via Youtube, with local embeds available after the jump. GooGie’s next online PS4 Mortal Kombat XL tournament has been announced for the first week of June. Once again GooGie is providing a pot of $50 for the winner and additional prizes will be announced soon. Entry is restricted to Australian and New Zealand players with proven stable wired connections. Instructions and live updates will be provided via this Facebook page so be sure to have it open during the tournament. Full details including tournament rules can be found at the official event page and we have an embed of GooGie Twitch channel after the jump. The full bracket is available on Challonge and Goodpart’s wrap-up can be found over on Facebook. After the jump we have the Twitch archive from the tournament. Be sure to check it out before it expires! Check out the full bracket here and click the jump for video archives of the event. Keep an eye on the Australia/New Zealand MKX Facebook page for future tournaments, events and meet-ups. Thursday Night Throwdown (TNT) returns! Goodpart’s TNT series will already be familiar to members of the Australian FGC, having provided online tournaments for Ultra Street Fighter IV. Now that Street Fighter V is here, Goodpart is relaunching TNT and taking advantage of the new PS4-PC cross-play functionality. Players need to register via the TNT Challonge page and be ready to use Discord for match coordination during the tournament. Note that the listed start time corresponds to Sydney (AEST). For full details and news concerning TNT, including official rules, tournament format and prizes, visit the event page on Facebook. GooGie’s next online PS4 Mortal Kombat XL tournament has been announced for the second weekend of April. Once again GooGie is providing a pot of $50 for the winner and additional prizes will be announced soon.